I know what you're probably thinking.....wowza those are one pair of VERY red trousers. Well you're not wrong there. 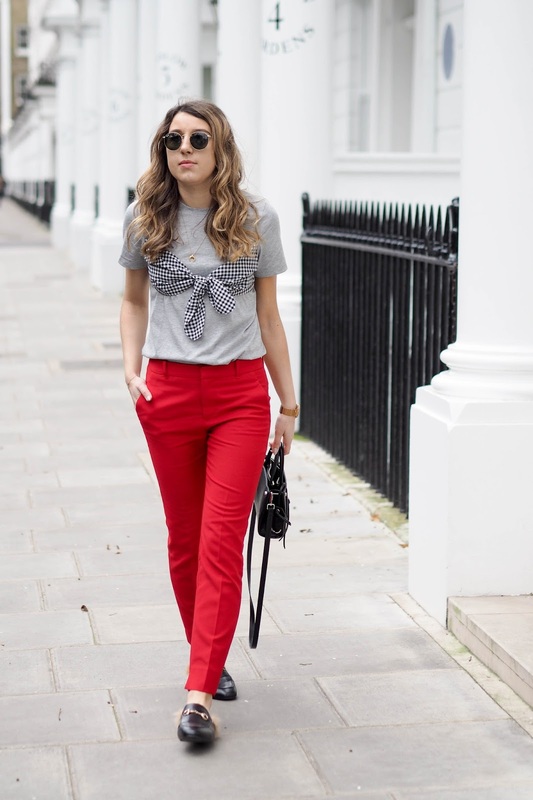 They could definitely stop traffic that's for sure but despite the in your face almost tomato hue, I can't get enough of these cigarette style trousers right now. 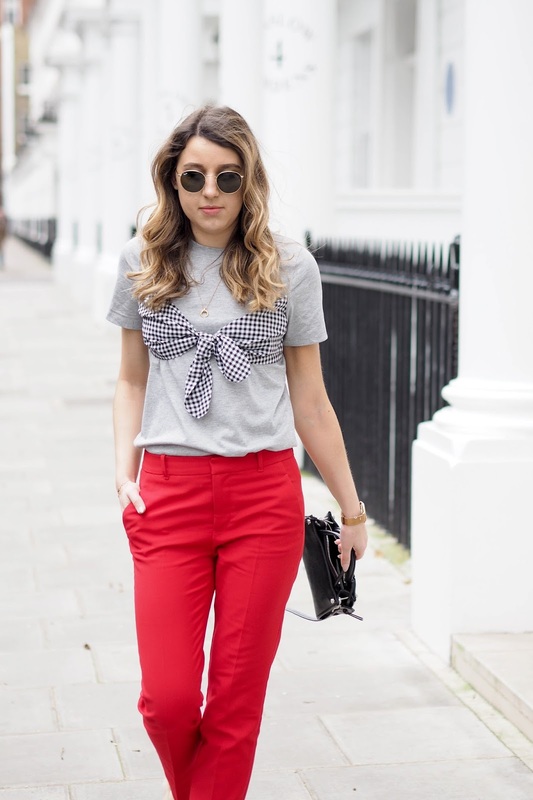 As gingham and red are two trends set to be huge for spring/summer I couldn't help but pair the two together in today's post. 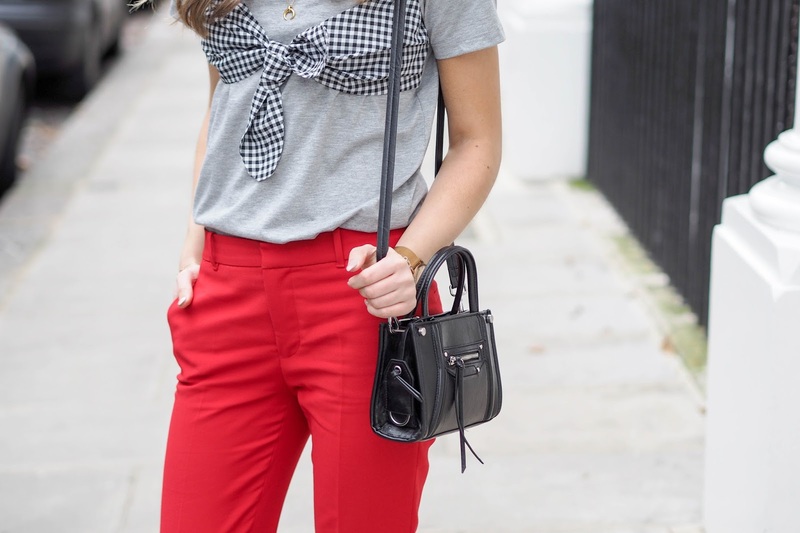 The chino style trousers make a nice change from jeans whilst the t-shirt with its gingham, bandeau detail steer this outfit away from looking too casual. I actually wore this very outfit for a day of meetings and it did the job of making me feel comfortable yet presentable. Something that can often be hard to achieve. 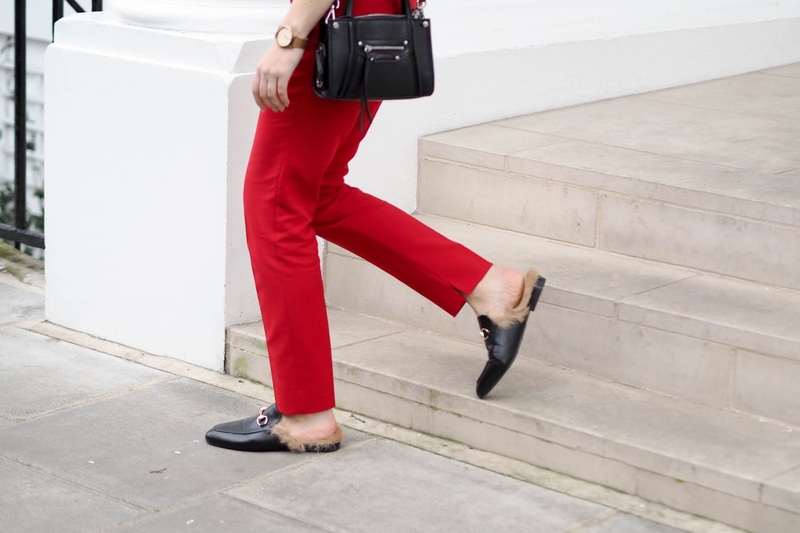 It's no secret that I love a good pair of shoes and these backless loafers are no exception. I am a lover of all things Gucci (my wishlist is seriously getting out of control) but quite frankly can't justify spending £500+ on a pair of shoes that won't be glued to my feet. These dupes are the best I've seen and I'm shocked that they under £25! I must admit I do feel a little as though I'm wearing a glamorised pair of slippers out of the house but they are so comfortable I simply don't care. Let's face it that's actually the best part about these backless mules. Who doesn't want to feel as though they've got warm fluffy slippers on their feet whilst making a bit of a fashion statement?! I mean I've definitely heard of worse things haven't you?! See them for yourself here and as always full outfit details can be found below. Love the red colours, the jacket is to die for!